Finally…mortorcycle season has arrived! What better way to herald your trip to the open road than a first hand look at the history of America’s first and legendary motorcycle. From dominating racetracks in the early 1900’s to support for our allied forces in both WWI and WW2, Indian bikes have been legendary. 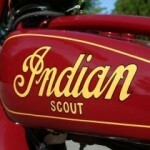 Originally manufactured by the Hendee Manufacturing Company in Springfield, Massachusetts, 1901-1953, it was renamed the Indian Motorcycle Manufacturing company in 1928. During 1910, It became the largest manufacturer of motorcylces in the world and produced the popular Scout and Chief models. Bankruptcy claimed the company in 1953, but a number of successor companies perpetuated the name and quality over the years. Today, Indian motorcycles are produced by Polaris Industries and are just as popular as ever. For more detailed information about this American legend, we invite you to explore more from the official website. This exhibit runs through October 24, 2014 and includes approximately twenty five fine examples of inventive technology and pure beauty. 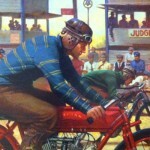 Of special note, motorcycle artist David Uhl has provided some of his art to round out this show.